If you are interested in developing any number of sports pitches we will manage the whole project for you, from initial site investigation to finished playing surface. As experienced sports surface designers and project managers we bring all the elements together to realise your ideas, whatever the scale. Agrostis will initiate and monitor the project from beginning to end. Sport England and the Football Foundation often ask for ‘before’ and ‘after’ assessments of sites where they have provided funding. 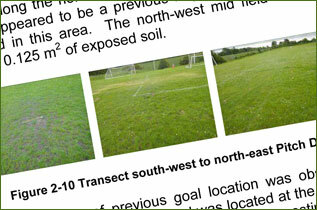 A typical ‘before’ assessment for the development of a sports ground on agricultural land is provided here (2.7Mb). 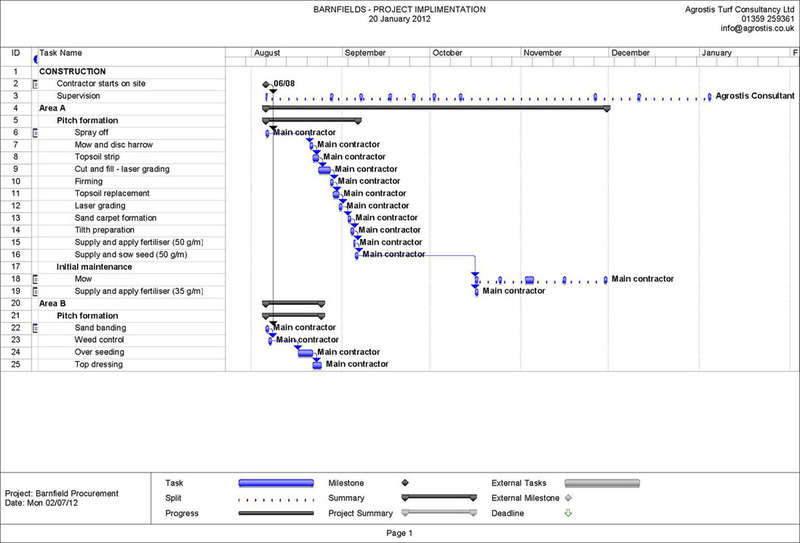 A typical ‘after’ construction assessment is provided here (1.8Mb). Sport England are statutory consultees where planning permission for sports facilities are being applied for and they will ask to see reports like this. 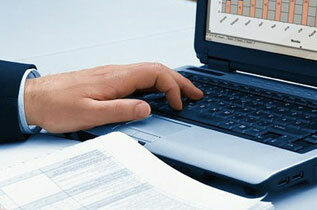 When grant aid is being sought, a pre-construction assessment will also inform the funding body of the expected cost. From an early stage the report will therefore help determine what the technical and financial implications of a particular development will be. Sport England standards of performance (PQSs) are all covered by the assessment. 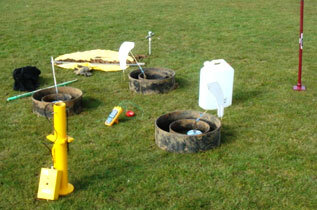 These include infiltration rate and hardness which require specialist equipment to undertake. For more on Agrostis’ approach to natural turf surface evaluation click here. Where appropriate Agrostis will also undertake a 3D levels survey. This provides an accurate plan of the site and indicates whether and to what extent levels or slope may need to be adjusted to bring a facility in line with the expected standards. The survey will also serve as the template upon which any subsequent design and specification work may be built. Agrostis can also undertake additional investigative procedures. These include mapping of soil moisture levels and detailed soil structural and textural analyses. This information is not usually essential but is required in some circumstances. The data feeds in to Agrostis’ ongoing research programme, helping us understand how best to improve all our client’s sports surfaces. The initial site investigation also tells us, Agrostis, what should be done in practical terms. We will then describe this in great detail in a specification of works. The relevant drawings and calculations are based and superimposed on the levels survey and the whole undertaking is fully quantified in the bills of quantities. The specification tells a contractor exactly what needs to be done. It also defines the standards that are to be achieved in terms of the quality of the end product and of the materials and method of installation by which this is provided. The bills of quantities list the operations that need to take place and indicate the quantities of ‘stuff’ that needs to be used in the project. This might include how much topsoil needs to be moved or imported, how many metres of drain need to be installed, how much sand is to be applied to the surfaces etc. Contractors can therefore indicate how much they are willing to charge for each item. Added up, this gives their total price for the job. The completed bills of a number of contractors can then be compared, safe in the knowledge that all are bidding for exactly the same work; apples are being compared directly with apples and not kiwi fruit, as it were! If there are any questions, for example if a contractor is indicating that one particular operation is either exceptionally cheap or exceptionally expensive, we can ask why that might be the case and that the tender be adjusted accordingly. Many of these companies are quite large and may not be concerned to win a small project. 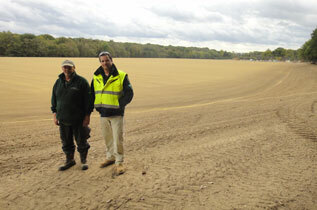 In these situations Agrostis are happy to invite local contractors to bid for the work. Such companies may have a particular interest in bidding for a project; the director may be a member of the sports club for example and not infrequently such companies can offer the best all round solution. As we may have no experience or knowledge of their ability or capacity to undertake the work, however, the incorporation of the detailed specification into a formal contract, which should subsequently be thoroughly supervised, becomes a vital means by which our clients can be assured of a quality end product. 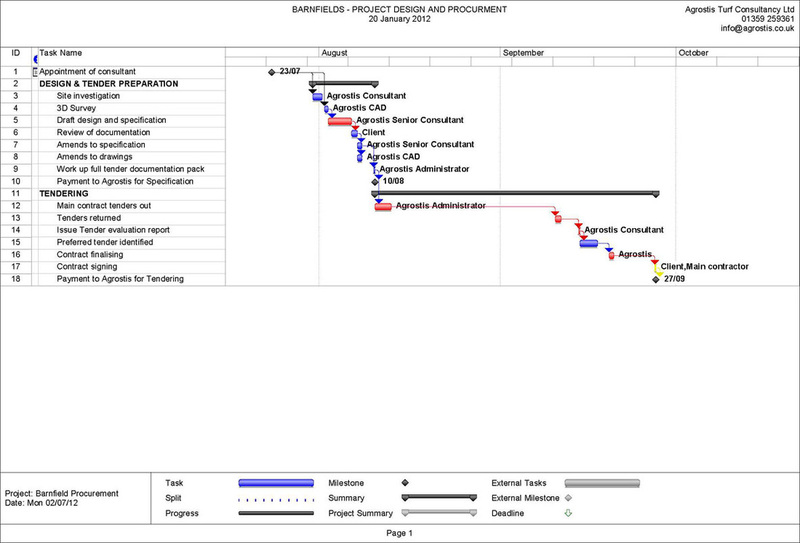 There are several components to project management and projects vary in the extent to which each of these is required. On large projects, a contractor may have their own project manager responsible for all that takes place on site. Despite the dedication and professionalism that the contractors we prefer to work with demonstrate, the default and primary obligation of a contractor’s project manager is to the contracting company, not to the client. Most clients are not fully conversant with the technicalities of sports facility construction so they need an independent body to advise and to act on their behalf. This is one of the roles Agrostis can fulfil. You will be kept up to date with the projects’ progress with regular written and verbal reports so you can continue to influence the project as it proceeds. Contractually, the work needs to be supervised so that when an invoice is submitted the client can be confident that what is being paid for is work that has indeed taken place or materials that have indeed been incorporated into the facility. If we are happy, then we will issue, at appropriate intervals, a Payment Certificate indicating that the contract has been fully adhered to and authorising payment of an invoice. On a practical level, monitoring also needs to take place so that the quality of the work is not allowed to fall below the standards set down in the specification. We will also ‘sign off’ the works so that both contractor and client are aware of when their respective responsibilities for the site begin and end. CDM Regulations are concerned with the health and safety aspects of construction projects. Only the larger projects technically fall within the jurisdiction of these regulations and even there the obligation is often tenuous with sports pitch development. Nevertheless, Agrostis have staff trained in CDM management and so we will undertake this aspect of project management where appropriate. As far as possible, we will extend the principles of the CDM regulations to all projects regardless of whether they are notifiable or not.